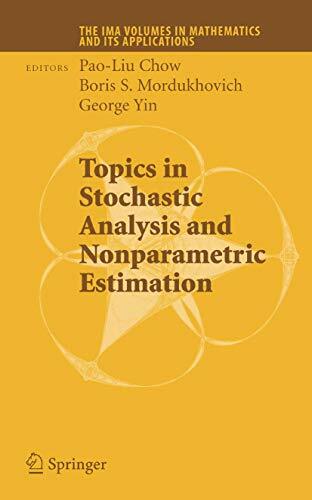 [PDF] Topics in Stochastic Analysis and Nonparametric Estimation (The IMA Volumes in Mathematics and its Applications) | Free eBooks Download - EBOOKEE! Description: To assess the past achievement and to provide a road map for future research, an IMA participating institution conference entitled "Conference on Asymptotic Analysis in Stochastic Processes, Nonparametric Estimation, and Related Problems" was held at Wayne State University, September 15-17, 2006. This conference was also held to honor Professor Rafail Z. Khasminskii for his fundamental contributions to many aspects of stochastic processes and nonparametric estimation theory on the occasion of his seventy-fifth birthday. No comments for "[PDF] Topics in Stochastic Analysis and Nonparametric Estimation (The IMA Volumes in Mathematics and its Applications)".